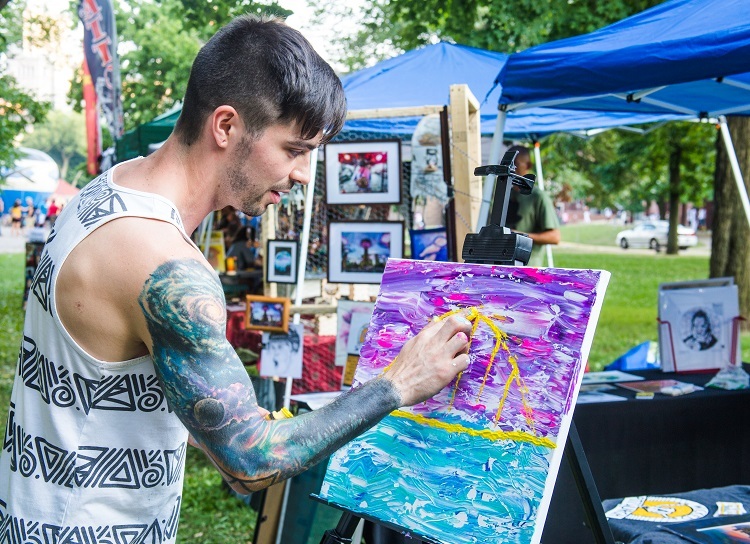 Zach Sierocki, a member of Wicked Pittsburgh, live paints during the Deutschtown Music Festival. Courtesy of Wicked Pittsburgh. 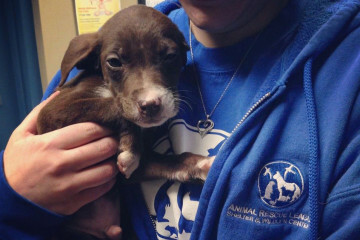 Don’t let the name fool you: Wicked Pittsburgh is a charitable organization. The new artist collective supports local nonprofits while helping creative types promote and sell their wares. So far, Wicked has donated to 10 charities thus far, including 412 Food Rescue, Allegheny County Parks Foundation and Meals on Wheels. “We aren’t here to make money; quite the contrary. We’re here to give it all away. Then search for more and give that away,” says Wicked co-founder Mike Schwarz. There are more than 50 artists currently on their roster, including painters, musicians, blacksmiths, woodworkers, photographers, graphic designers, jewelry makers, glass blowers and every kind of maker in between. Each person pays a $40 yearly membership fee, which gives them a profile on Wicked Pittsburgh’s online marketplace, a platform designed like a local Etsy. Artists are responsible for shipping their own online items, but Wicked covers the postage. There are also in-person opportunities to create, sell and display work, such as commissions, collaborative projects, pop-up shops, public murals and installations. 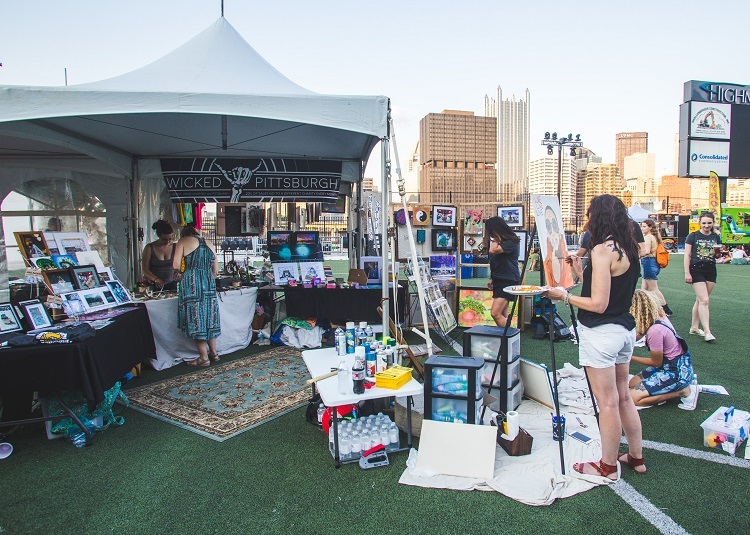 This past summer, Wicked Pittsburgh was contracted by Ascender to design the Thrival Festival entranceways, an undertaking that generated $1,200 for the participating artists. Each time a crafter sells something through the Wicked website or a sponsored event, the collective donates 20 percent to charity. If the sale is over five bucks, Wicked takes a five to 10 percent cut to cover basic operating costs. Over the past 18 months, Wicked Pittsburgh has raised more than $1,400 for 10 local charities, sold more than $6,000 worth of art and hosted a dozen events and partnered with organizations such as the Deutschtown Music Festival, Three Rivers Regatta, The Pittsburgh Wellness Collective and many others. Schwarz, 24, grew up in Waynesburg, Pa. After graduating with a degree in photojournalism from Boston University (where “wicked” is used as a synonym for “very”) he had a hard time finding a job. Wicked discouraged, he moved to Pittsburgh and took a lifeguard position to help stay afloat financially. On his days off, he searched for paying gigs in the city’s burgeoning art scene but as a newcomer found it hard to get his foot in the door. Eventually, he met Zach Nellis, a fellow woodworker and photographer. Together, the pair hand-selected 10 other like-minded artists to start Wicked Pittsburgh, with the goal of streamlining event opportunities, paying artists for their work, supporting local charities and making Pittsburgh more approachable for artists of all crafts, genders, races and levels of experience. Wicked Pittsburgh’s tent at the Thrival Festival featured wares from more than 30 local makers. Courtesy Wicked Pittsburgh. If you attend a festival, concert or vendor fair in the area, you’re likely to see Wicked’s tent, where its Advisory Board members handle all transactions. When a piece is sold, the artist will receive their commission via PayPal within two weeks. Graffiti artist Max “Gems” Gonzales joined Wicked to not only broaden his own audience but to help grow the Pittsburgh art scene as a whole. 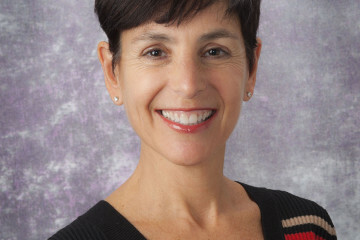 He now serves as the organization’s Artist Resources Facilitator, making connections with local grant programs, galleries, high schools and universities and community spaces. “The more success our individual artists receive, the bigger our arts scene will grow and that will inevitably allow for even more success, funding and visibility,” he explains. Wicked is built around the hard work of emerging Pittsburgh artists. To join the collective, people must send a short bio, a reason for the membership request and a portfolio link to [email protected]. “In the short time Wicked has been around, he has organized so many events and has gotten Wicked involved with so many locally established programs,” says collective member Benny Miller, an art teacher at Brentwood High School. The folks at Wicked Pittsburgh are busy planning a new round of money-generating events for 2019 and eventually would like to open a brick-and-mortar location that would serve as a meeting space, gallery, performance venue, artist incubator and storefront. Schwarz, who splits his time between Brooklyn and Pittsburgh’s South Side, believes the collective is already strengthening the Steel City’s art scene. “One artist can be quite influential, don’t get me wrong. But put 40 influential artists together with one collective philanthropic goal and you have a force to be reckoned with,” he says.